Disclosure: An ARC (Advance Reading Copy) of this title was provided by Carina Press via NetGalley. This rating, review, and all included thoughts and comments are my own. Recently cuckolded by his wife and his best friend, Joe Walker isn't having the best time of his life. A carpenter by both trade and desire, Joe takes on a rundown theatre with little more than determination and a need to build, but with the startling arrival of a small group of street performers and the opening of a magical door, the direction of Joe's life is set to take a sharp turn to the wild side. Stepping through the door introduces him to a quaint group of people who call their realm Quarter Square, a place where magic and mundane combine and offer up a safe haven for those who live life on the fringes. It is there he meets Min, an enchanting young woman with an ethereal voice. Her smile warms him; her presence gives him a sense of rightness and homecoming he'd never previously known. As he sinks deeper into the world of the insiders and embraces their magical existence, Joe starts to realize that he finally feels right, feels as if he's doing what he's meant to do, is living where he's meant to live. And with Min at his side, he's starting to believe he could never want for anything else. Joe's idyllic, magical interlude is shattered when a horrible crime opens the door to a grim truth about a past that spans lifetimes and a love that's shadowed by a monstrous hunter intent on rending and bloody destruction. Joe's bloody destruction. Jam-packed with plot and character, this shorter-length novel is an exciting debut by a fresh voice in urban fantasy. I don't read many male authors in the genre, so it's nice to get a different perspective now and then, and I enjoyed much of the content of what I read by Bridger. He sets a restless, frantic pace in the narrative, with plot points racing by at breakneck speed as he sets up the world and the mythos and defines his characters. Too restless and frantic for my personal tastes, actually, as there was little time to meander and admire the descriptive and sometimes lyrical turn of phrase here and there, or have a mood set or broken by a twist and turn in the plot. Instead Bridger lays out what happens in an economical, highly streamlined fashion that borders on sparse, with no filler, fluff, or expansive detail. There is something appealing, almost comforting, in reading a male protagonist as written by a male author. I don't know why, exactly, and maybe it's entirely imagined, but I find when done well, it's almost like reading about another animal entirely...one with far greater similarity to real men than those as portrayed by female authors across many genres. Oh, it's not that I like them more...this isn't about prejudice in that regard, it's more a deeper sense of realism and if anything, a more poignant sense of potential catastrophe, as if men, being men, believe their male characters far more fallible than women do (or would write them). It's a refreshing, if slightly more humbling, viewpoint. I enjoyed Joe as a character, as an Everyman turned sort of...other, he was very successful at being likable and sympathetic. I was less fond of Min. In fact, I actively disliked her, and instead of seeming this wonderful soul mate for Joe, she seemed an arrogant, faithless, entitled, condescending harpy with little spine. I quickly tired of her telling Joe what he must do and who he has always been. I wouldn't have been at all depressed had she been eaten. There were several secondary and ancillary characters I would have much preferred had received a more expansive role in the story, and several scenes including Min that I could very well have done without. That actually leads me to the two major points of contention for me in the book. The ambitious nature of this debut and the slick, economical writing style conspired to make the book seem far too heavy with content for me. Too much happened, too many creatures and people and things and agendas went on or were introduced or were mentioned. It made this short novel feel cluttered, rushed, and occasionally heavy. There's truly enough going on in this book to comfortably fill two of equal length, with a higher degree of definition and exposition. I was also seriously disappointed in the abrupt ending that didn't come near resolving one of the major conflicts that were set up in the story. I would understand that if it's going to be the series plot arc. Can't really tie that off at the end of the first book. If that's the case, though, it was given entirely too much development and attention in this crammed piece, and could have easily taken more of a back seat role as the rest of the many, many plot points were developed. I was left feeling a little perplexed and unsure of the series arc and the author's intentions for it. That's not necessarily a bad thing, really, but as it left the end feeling just a brush removed from a cliffhanger, it also isn't one that appeals to me personally. 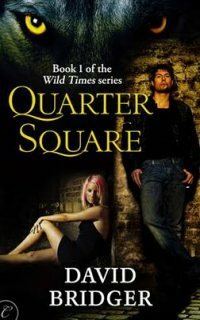 There were parts of Quarter Square that I enjoyed very much, and parts that didn't work for me at all. Things that appealed and things (or characters) that didn't. When all was said and done, I think the series has promise and Joe is worth watching. I'm interested to see where it all goes from here.